The 4116A- Misk 4PC King Bedroom Group by Lifestyle at Miskelly Furniture in the Jackson, Pearl, Madison, Ridgeland, Flowood Mississippi area. Product availability may vary. Contact us for the most current availability on this product. You deserve a bedroom that is pleasing to you; a bedroom that has a look and an aurora that makes you feel satisfied. 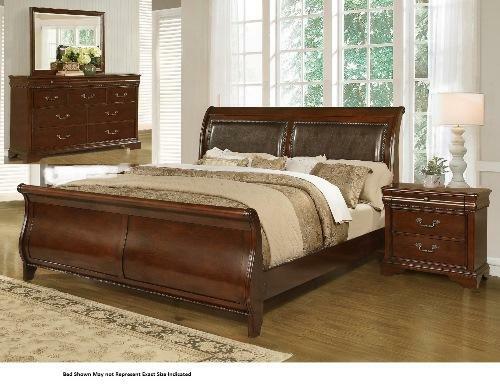 The 4116A bedroom collection carries itself in a Louie Phillipe manner that establishes character in the bedroom. The group features Nailhead trim throughout the pieces. The 4116A- Misk collection is a great option if you are looking for Traditional furniture in the Jackson, Pearl, Madison, Ridgeland, Flowood Mississippi area. Browse other items in the 4116A- Misk collection from Miskelly Furniture in the Jackson, Pearl, Madison, Ridgeland, Flowood Mississippi area.